So I’m finally getting back into the model building again and I finally broke down and bought these two beauties. 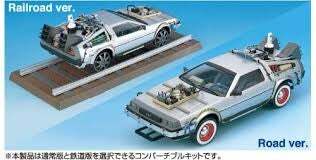 I have a diecast Welly DeLorean but I’ve always wanted the Back to the Future 2 & 3 versions. I’m not sure how long these will take to get here since they are coming from Japan but I can’t wait to get started on them. The 2 version has wheels that rotate to the flight position and back to road version and 3 version can have either the train wheels or road wheels.